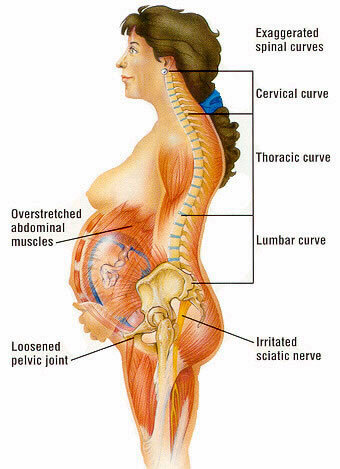 Lower back pain, pelvic girdle dysfunction (PGD) and upper back pain are common in pregnancy. They happen for a number of reasons, but the good news is that physiotherapy for pregnancy, Pregnancy Yoga and pilates exercises can help a lot. Back pain in the lumbar spine happens when the weight of the baby draws the pelvis into an anteriorly tilted (forward) position. This means the joints in the lower back are compressed and muscles have to work extra hard to keep you standing. At the same time, abdominal muscles are being stretched as baby grows, reducing support for the lower back. This can irritate discs and affect leg nerves causing leg and groin pain. Pain in one side of the pelvis at the sacroiliac joint (SIJ) is common. Often this is caused by the changing load and decreased stability in the pelvis. In pregnancy, a hormone called Relaxin is released that causes your ligaments to soften, allowing baby to pass through the pelvis during birth. A side effect is that the pelvis becomes more unstable and can cause catching or movement at the sacroiliac joint. The same changes can also cause pain at the Symphysis Pubis (the front of the pelvis). The release of Relaxin affects more than the pelvic ligament. You may find your balance isn’t quite as good as it used to be and that you have developed wobbly knees and ankles - so watch your step! As baby bumps grow, posture adapts and alters the body's centre of gravity. This can affect the way the body moves and can make the upper back curve forward and become stiff. Stress can also contribute to these bodily pains, so, if things are emotionally draining, back pain can increase. The good news, there are ways of alleviating these aches and pains. Be aware of posture! Slouching strains the spine, so whether sitting, or standing, think about tucking your tailbone under a little, drawing in lower abdominal muscle and rolling your shoulder blades down your back to lengthen the spine. Pelvic tilting exercises are also a must in pregnancy, and can be done by drawing the pelvic floor muscles in and up. Secondly, try sitting on a gym ball. 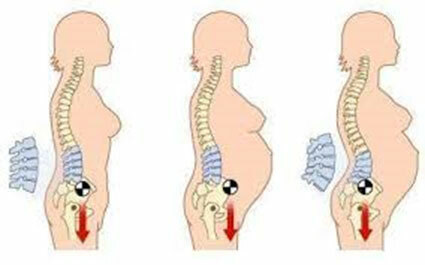 The weight of the baby will be distributed through the ball putting less load on the lower back. You can also use the gym ball for pelvic tilting. Pelvic stability exercises specific to pregnancy can help, particularly Pilates type exercises which can also help you keep your pelvic floor and deep abdominal muscles (the ones that support your back) strong. Finally, invest in a good pregnancy pillow which you can put between your legs and under your bump when sleeping. Physiotherapy can often bring instant relief from back pain in pregnancy. Treatment may consist of gentle joint mobilisation, massage, kinesiotaping (to help support bump), posture education and prescribed Pilates or yoga type exercises. Physiotherapists can also use acupuncture to help relieve back pain in pregnancy and can prescribe maternity belts that can help lessen the load on your pelvis. Keep as active as you feel you can. Don’t suddenly start training for a triathlon, but if you were active before your pregnancy, keep going as long as it feels comfortable. As you progress through your pregnancy try pregnancy specific yoga and/or Pilates. These classes target the areas of the body affected by your changing body. You will also learn breathing exercises which can help you relax, connect with your baby and help during labour. Swimming can be a great non-weight bearing exercise (but watch you’re not arching you’re your back too much), and you might not even feel pregnant when in the water! If you like the gym try a stationary bike or cross trainer, and, if nothing else, make sure you do some walking every day. If you are in pain, do see a physiotherapist we’ll likely be able to help you relieve some of that discomfort as well as help keep you fit and prepare you for labour. Wellfit Mumma is run by Senior Physiotherapist Rosie Taylor. She offers pregnancy physiotherapy, pregnancy yoga and mother and baby yoga at Treat clinic .